I have a lot of dreams related to writing. Mostly they tell me that I need to, that I am not spending enough effort toward it, that I have a calling, what am I waiting for…you know: WHY AREN’T YOU WRITING? I go through phases where it is all that I think about. But sometimes, when work is burdensome and I am tired and there are too many other distractions either personal or professional, I will have one of those dreams that knocks me back into place with a jolt. The quote above was a from a dream. One that I woke up from like walking through a door. I won’t go into details, but the one person whom I would listen to without question said these words to me: “Write like your life depends on it.” I’ve been haunted ever since. And I must write these instructions on my heart and do so. I am a writer. I am published. I make my living by writing. Guess what I have to do now. Write. 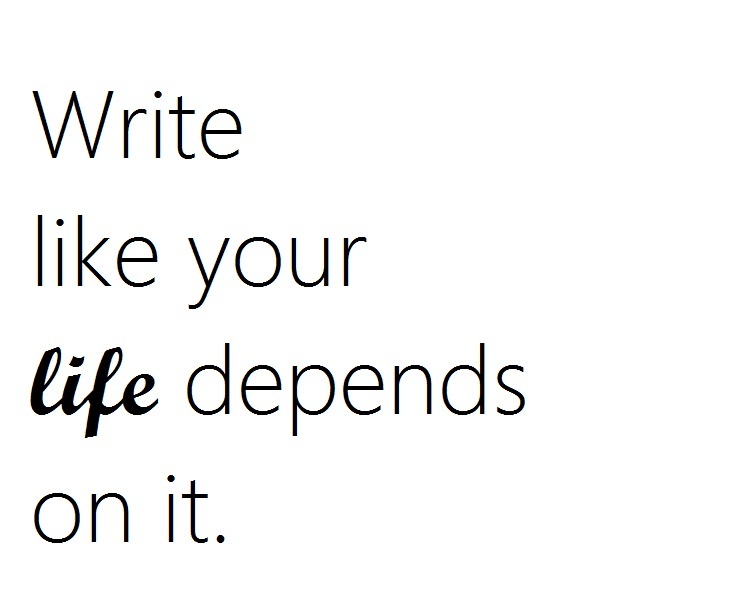 Write like my life depends on it. Because it does. If I don’t make it my life, I’m never going to create the reality of “being” a writer. For now, I will write as much as I can in my spare time, I will carve out spaces in weekends to write, I will create a routine to write every single day. My goals will be like stepping stones that get me from one side of a river to the other. Write a scene using color as a theme. I will post my results tomorrow.